I just watched episode 32 of DokiDoki Precure. I know all of us here talk about how impressed we are with Precure, but I still am more and more amazed the more I watch. These shows really present some complicated issues regarding innocence and love, and they give us such wonderful answers to these issues. In episode 32, we run into the dilemma of The Happy Prince. A more familiar tale to the modern reader might be the Giving Tree. The dilemma is one of selfless giving and whether there is a point where this can be taken too far. In the episode, the school is having its cultural festival, and Mana-chan wears herself out to the point of getting sick working on the festival. 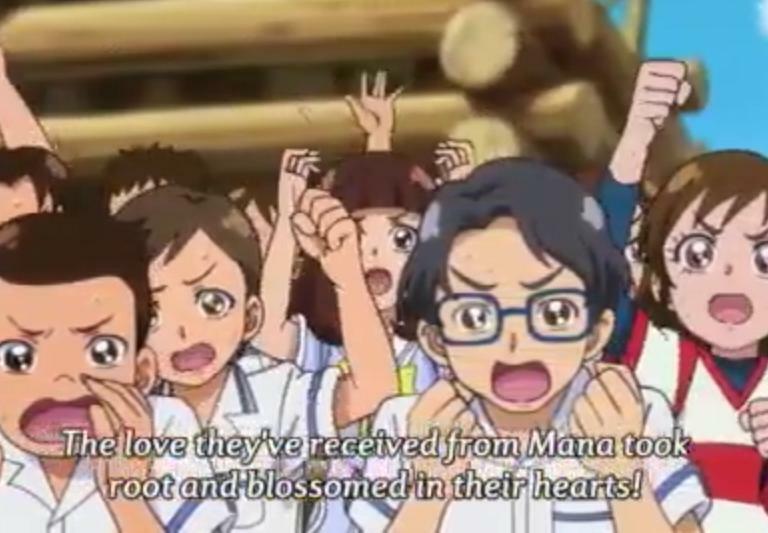 During the episode, it also becomes clear that the other students have likely been relying on Mana-chan too much. After reading the story of The Happy Prince, Aguri-chan takes it upon herself to remedy the situation. She orders Mana-chan to bed, and proceeds to do what she thinks is needed to bring everything in balance. She takes it upon herself to chide the other students. After she has done so, she accuses Mana-chan of pampering everyone, leaving them open to becoming Selfishnesses. She says that they should all learn to stand up for themselves as individuals. Aguri-chan’s words are similar to Western conventional wisdom and notions of “tough love.” Mana-chan had a very different answer to this problem. She recognized that everyone did need to be as strong as they could be, but explained that everyone had things that they could and could not do. Mana-chan also talked about the warm and exciting feeling of helping and being helped. After this, we see that the other students took Aguri-chan’s words to heart. They began to do their best, or ganbaru. They work hard and solve problems themselves. Aguri-chan sees all of this and learns a lesson herself, which is the lesson of what it means to love and to be loved. With this lesson, she gains a new power as Cure Ace. At the end of the episode, Mana-chan and Aguri-chan talk about a world where one can give selflessly safely, and Aguri-chan says that she would like a work towards such a world being possible. This is a really complex issue, I think. One of the reasons it is so complex in this day and age is that the concept of understood virtue and fault has been lost. In the world today, particularly in the West, there is a utilitarian notion of right and wrong. Right and wrong are often seen in a pragmatic light. Things are good and bad depending on how they effect us, other people, and society. This leads to some very strange practices, one of them being “blaming the victim.” There is a belief that if one is being mistreated or taken advantage of, it is her job to stop it, and that if she allows it, she is “enabling” the other. From a utilitarian standpoint, there may be truth to this, but it is quite topsy-turvy. The reason I think we tend to blame the victim is that generally it is harder to get the wrongdoer to change her ways. In a democratic society, there is also the notion of individual “rights,” and individuals are have the responsibility of protecting their own “rights.” Taking this notion further creates the implication that if someone can not protect her “rights,” it is ok for others to trample upon her. This episode has a much different analysis of this problem. The issue is not about whether Mana-chan is “enabling” others, or whether she is giving more than everyone else. The issue is one of virtue and fault. Selfless giving is a virtue. Not doing one’s best is a fault. Aguri-chan takes on the role of Authority in pointing out the faults of the other students. The students accept the reprimand from Aguri-chan, even though she is an elementary school student, and in general, she is not in a position to issue such a reprimand. They accept the reprimand because they can see that she is speaking truth, and that she was pointing out a true fault of theirs. They knew that they could not refute what she was saying. In accepting the reprimand, the students were able to correct their fault, and they do ganbaru. The answer was not Mana-chan holding back but was everyone else stepping up to the plate. This is also the innocent answer to the problem of The Happy Prince, rather than the cynical one. People can change. People can respond to selfless love in a loving way, rather than in a selfish way. This is the lesson that Aguri-chan learned, and it warmed her heart. I think it is a lesson we can all learn as well. Does this always happen? No, of course not. We all have faults, and we are all tempted by our False Self at times. There are those from the Selfish Kingdom who will exploit those faults. 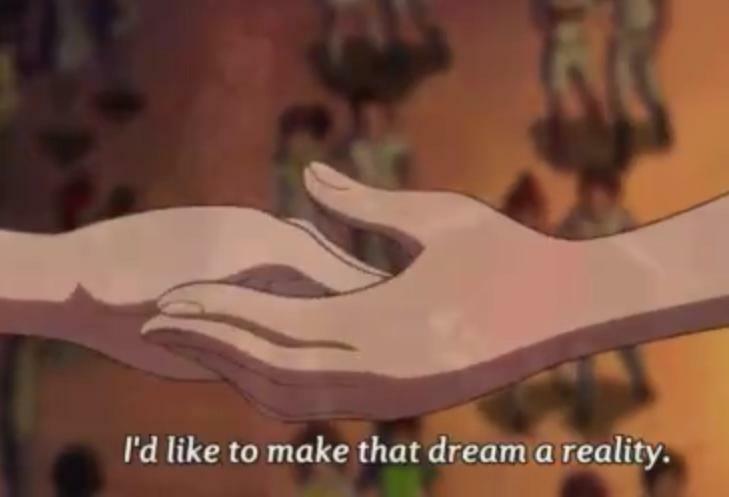 Yet, as Aguri-chan and Mana-chan said at the end of this episode, we can all work to create a world where it is safe to give and to love with all our hearts. We do this by giving of ourselves, freely letting our virtues shine, and willingly accepting correction to help minimize our faults. We can respond to love by loving in return. This is what innocence is all about, I think.